I’m a fan of traveling the USA by RV. My family and I have been traveling this way since 2009. So when it came time for my oldest son to visit prospective universities on a quintessential, college road trip, an RV was our preferred mode of transportation. Even if you’re not a veteran RVer, I still think that it’s a good choice for a family that needs to cover a lot of ground. If you’ll be renting an RV for the first time, be sure to read our 10 lessons to learn before renting an RV. And then head over to our friends at Outdoorsy to find the perfect rig for your family. Outdoorsy operates like Airbnb, connecting RV owners with would-be renters. As for us, we headed out in our 38-foot Newmar Ventana. On our family’s epic college road trip, we traveled 7000+ miles across the country, visiting 10 universities (and four national parks) in 30 days. Here are 10 tips for getting you started. KidTripster Tip: Even if you plan to do your college road trip by car, the following advice will still be helpful to you. KidTripster Tip: If you’d like to hear about what living in an RV for 30 days on a college road trip is really like, listen to our editor Shellie describe the adventure to our friends at RV Family Travel Atlas on their podcast. Start planning at least six to nine months in advance. And be sure to keep a written, master plan with details regarding travel (daily driving miles and driving time), lodging (campgrounds, hotels, and other accommodations with confirmation numbers), college particulars (orientation and tour times), and other activities. With your son or daughter, come up with a list of colleges that you want to visit. Research on each college’s website when the school offers visits for prospective students. Visits are two parts: 1) an orientation session that typically lasts one hour and 2) a campus tour that takes another hour. Note the times when the orientations and tours are typically offered. Know that you likely won't be able to sign up for your visit until three months in advance, but you should proceed with your planning as if you'll be able to get your preferred choices. Then make a note on your master calendar to go back and sign up when registration opens for those schools. Call the admissions office of each school and ask about parking. Make it clear that you'll be driving an oversized rig. Sometimes the folks in admissions will direct you to call Public Safety. At the very least, you'll likely be able to park in the school’s stadium parking lot. And before you leave home, download a printed map of each campus, noting the designated parking area. KidTripster Tip: Some drivers tow a vehicle behind their RVs to give them more flexibility. However, especially if you’re new to RVing, towing can add unwanted complications. We don’t tow. Next plot your initial itinerary with all your university stops. It can be tricky because some schools don't offer tours on Saturdays or Sundays, so you'll need to take that into account when planning out your days. Also be mindful of how many hours per day that you’re willing to drive. My husband and I share driving responsibilities, each driving about three hours at a time. As veteran RVers, we max out at about eight or nine hours per day. KidTripster Tip: If you use a tool like Google Maps to plot your course, make sure you add at least an hour to your calculated drive time each day. You don’t want to be pushing it on the highway in an RV . We had 30 nights of camping on our college road trip. Consider all your options: full-service campgrounds, state and national campgrounds, even overnights in Walmart or Camping World parking lots to save money. KidTripster Tip: Not all Walmarts and Camping Worlds will allow overnight camping, especially in urban areas. Call ahead to get permission. Make sure to write down the name of the manager who gives you the okay. If you’re on a trip that spans several weeks, don’t be afraid to get out of the RV for a few days and treat yourself to a hotel or resort stay. About halfway through our month-long trip, we spent a few days at the The Omni Homestead in Virginia. It was just the break that we needed. We’re fortunate to have friends and family who live all over the USA. Many of them drove to see us on our route. For example, Grandma drove from Michigan to meet us in Indiana. Friends from Lexington met us in Pigeon Forge. We visited with other friends who live in Washington, D.C. and Boston. Interacting with other people on our trip was key to keeping our sanity. Sometimes, there aren’t good camping options in urban areas. Instead look to stay outside the city in a location that has access to public transportation. Call the campground ahead of time to sort that out. For example, Normandy Farms Family Camping Resort is a short Uber ride from the train system that runs north to Boston (MIT and Tufts University) and south to Providence (Brown University). Most unusual place that we "camped?” When we couldn’t find a campground in the Chicago area near Northwestern University, I called up my alma mater and asked to camp in the stadium parking lot. The facilities manager agreed. Alum status has its privileges! This last tip is for your student. Make sure he or she takes copious notes after each college orientation session and tour. Trust me, after you visit a couple college campuses, they all start to run together! Editor Shellie Bailey-Shah’s son ended up choosing a university that wasn’t a part of the epic road trip. He’s now a freshman at the University of San Diego. Nonetheless, it was a memorable family adventure. Consider renting an RV or camper with our friends at Outdoorsy. It’s the Airbnb of RVs, matching RV owners with would-be renters. 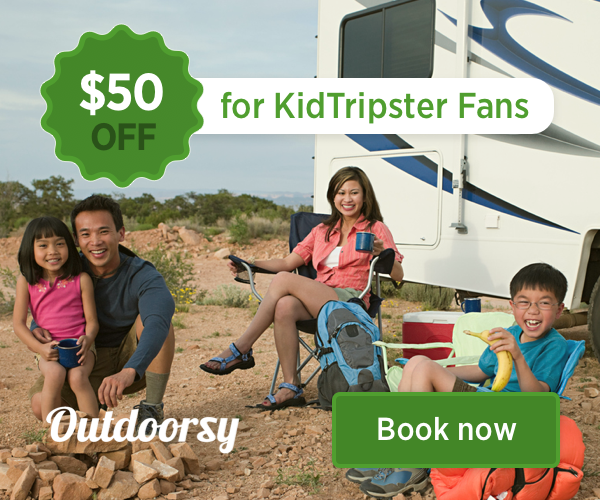 Use this link and get an extra $50 off your booking just for being a KidTripster fan! In addition, KidTripster will get some coffee money from Outdoorsy at no cost to you.